Willie Nelson is — no argument — among the five best living songwriters on either side of the pond. Sure, lately he’s become more interested in preserving his image as America’s Stoned Grandpa than he is in making the aching sort of music he made back when he was still an actual red-headed stranger, but he’s comfortable these days, and comfort has never been good for country music. Johnny Cash refueled on Nashville’s disassociation with its biggest hitmaker in the ’80s and later mined his spirituality, while Charlie Louvin fought his brother’s demons, Loretta Lynn fought her husband’s philandering ways, and Merle Haggard fought everyone. Since beating tax evasion in the nineties, though, Willie’s taken things pretty easy, one Louisiana state trooper notwithstanding. But back in his day, which is to say just about every single day from 1956 through 1989, Willie was a master of the human condition, a lonely and frustrated chronicler of the Great Country Virtues — whiskey, Jesus, sin, redemption, murder, love, doubt — plucking great stabs of heartache and celebration like so many nylon guitar strings. 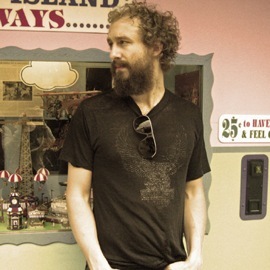 Birthed from the loins of that great body of work is Phosphorescent‘s To Willie. Matthew Houck recorded eleven Willie songs in a sort-of love letter to the master’s work, much like Willie himself did for Lefty Frizell on 1975’s To Lefty, From Willie. Like Willie, Houck and his band have masterfully reinterpreted their selection of songs, maintaining the dignity of the originals while tilting them ever-so-slightly into their own glow. Rather than rehash the big hits, which would have made a brilliant enough record in its own right, Houck chose deeper cuts, his own personal favorites, ranging from Red Headed Stranger’s love hymn “Can I Sleep In Your Arms” to the practically-unknown “Too Sick to Pray.” The result is a stunning cross-section of virtue, an album of drink-repent-repeat that sounds sick of the cycle on its first spin. This is what Phosphorescent does well, perhaps even better than Willie himself. Houck is acutely aware of the worn-down paradoxes of country music, and his music is all the better for it. While Willie and Merle sound like they’ve already gone through the storm on the original version of “Reasons to Quit,” Phosphorescent are still in the middle of the pain. The boozy, foot-dragging band are the melancholy type of tear-in-the-beer drunks that Willie and Merle recall with a twinkle in their eyes, as if the existential emptiness they felt was an effect, rather than the cause, of their drinking. Phossy knows better. The brokedown power of To Willie can’t be denied. While Willie’s songwriting may have provided a more-than-ample foundation, Houck goes a long way towards making these songs his own. What could have been a schmaltzy love letter feels instead like a testimony; one gets the feeling that Houck has lived these songs, and that the songs themselves are what brought him through the shadows. He sounds much more alive, more in control of his voice and his band here than he does on Pride, Phossy’s 2007 release which at times needed to shout to be heard. “I Gotta Get Drunk” finds the band at their most raucous, with slide guitars and Houck’s voice rising almost to a shout. “It’s Not Supposed to Be That Way” finds Houck tearfully duetting over layers and layers of fingerpicked guitars, practically whimpering the chorus. “Walkin’” stumbles along cautiously, hands on the guide rails, before gorgeous fields of pedal steel guitar sweep the singer off of his feet and into some sense of protection. By the time Houck begins the second verse, the hangover’s gone; “there ain’t nothin’ worth saving, except one another,” he sings, and he means it. i love this. great write-up. Great write up and great track. Thanks. Merle’s gotta be one of the other five greatest living songwriters. That’s 40% from the world of country music. Not bad. Bob Dylan’s still alive and kickin, and without doubt one of the five greatest living songwriters. This is a beautifully written article. Ya’ll done Willie right. I’m going to go out and buy this album so I can hear it. Great song indeed, and glad to see the bearded indie set appreciating a country legend – but of course Willie is an American legend as well. 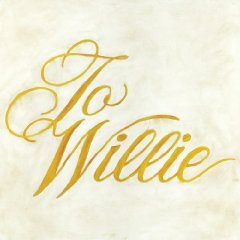 Lately I’ve been obsessed with Willie’s “Hello Walls” and “Nightlife”, solid songs themselves – but I’m sure there’s many more from his earlier albums that I’m clueless about. Could the great AD come up with a post of Willie’s originals to compliment this albums, a la the Vetiver originals post thats still blowing my mind? Excellent review, Marty. One of your best. I’ll have to give the record a spin. YES! Excellent idea. I’m on it. I love both Hello Walls and Night Life. Brilliant tracks. Thank you thank you thank you! Great review – this is what I love about AD. Phenomenal writing. I must get this album (and 1000 others). In response to comment #5, I agree about Bob Dylan. A Bob Dylan covers album by Bon Iver would be the best album of the year if it existed (I don’t know why Bon Iver – probably related to Justin Vernon accolading New Morning). The Fleet Foxes devoting an entire album to covers of CSNY songs would also be nice. I wonder if Lefty Frizell was as much of a popular culture icon in 1975 as Willie is today. I also wonder if that compromises the integrity of a Willie Nelson cover record. If an artist has lived some songs, I’d prefer for them to be his own. This sounds curmudgeonly, but I want to know what Mr. Houck has to say, not what Willie has to say for him. That said, the track is great. I imagine the album is as well. I just don’t know what that means. very impressive review indeed! and i was delighted to find him on emusic to fill out my monthly downloads! the song selection is excellent – i love that several of them come from my favorite willie album “phases & stages” (1974), a concept album following a breakup – first half from the woman’s point of view and secondly from the man’s side – highly recommend it. anyway i do love these covers and appreciate the intro to phosphorescent! nicely done, fellow athens boy.